A vital part of our campaign to see the return of 'Frank Black' has been to bring as many of the cast and crew of Millennium along with us for the ride, to this end, we have been greatly encouraged by their warm response to us. 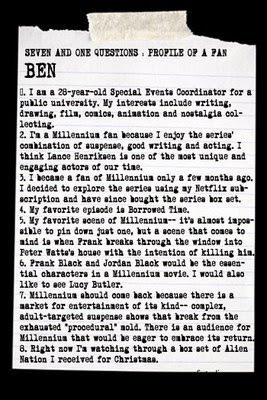 To whet your appetite and to inspire you we lead with the thoughts of 'Ben' and hope you enjoy reading his own thoughts about our beloved franchise. 3 Responses to "Seven and One Questions - Profile of a Millennium Fan"
Lisa, 22 yrs old. I'm a full time student, starting at UCI this Fall. I'm also a full time employee of the Orange County Sheriff's Department. The murder mystery story line with the supernatural twist of Frank Black hooked me immediately. Frank Black is a unique and intense character that walked on the edge of the knife. I couldn't help to want to learn more about him and his adventures, and to care for him. I watched the show when it aired on TV, even as young as I was (10 yrs). I recently had a rebirth of fandom when I was able to rewatch the series on DVD. The Sound of Snow. To me, Catherine balanced Frank perfectly. I was very sad to see her go, and it was great to see her back. 5. What's your favorite scene or moment? In Mikado, when Frank attempts to "put in words" what it is he sees or feels, creeping out the computer guy. It was a strong series, a great story, and it should be given the closure it deserves. Aside from Millennium, some older stuff like X-Files, Stargate SG-1 and Buffy. Nothing really new, just Ghost Hunters, and a lot of movies. 2.Why are you a fan? I have been an avid fan of Lance Henriksen since the early 1970’s when I was a little girl. I began watching Millennium because Lance played the starring role. I was hooked from the first episode. The mythology and the uncertainty intrigue me to keep watching. Every time I watch an episode, I see something new. 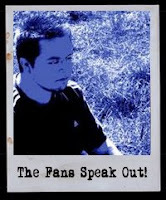 3.How long have you been a fan? I have watched faithfully from Millenniums' inception in October of 1996 and in reruns on Chiller. I bought the box set of DVD’s and still watch it once or twice a day. If I don’t get my Millennium, I get very upset. It is my crutch, my X-Files if you dare. The Sound of Snow: This one answers the burning question, what happened to Catherine in the forest? 5.What's your favorite scene or moment? From The Sound of Snow, when Frank tells Catherine he loves her and begs her to “don’t go” and at the end when Frank tells Emma … "They gave me my wife back”. Catherine is there, in the forest and then she fades away and all that is left is the sound of snow. AWESOME! 6.If a movie was made which characters would you like to see in it? 7.Why do you think Millennium should come back? The fans deserve it. We have been loyal. If enough of us want it and we spend our hard earned money to buy the DVD’s and the action figures, then we should have the right to Bring Back Frank Black. THE TIME IS NOW and we want to see it. If they film it, we will watch! 8.What are you watching right now? Right now I am watching Closure. Then I will watch …Thirteen Years Later. Tonight, after work, I will watch American Idol. My name is Paul Clark. I'm 57 and work as Chaplain and Director of the Multifaith Center at Albright College in Reading, PA. I use episodes of MILLENNIUM in all the classes I teach, and I write poetic meditations on the mythic reality of Frank Black. The collection is entitled: THE MAN IN THE BLUE BATHROBE. As I watched MILLENNIUM, I knew that something was happening unlike anything I'd ever seen. Lance Henriksen was creating his masterpiece in Frank Black. For the first time, I was watching a long meditation on good and evil, hope and despair, and the shamanic journey of a man. I have been a true enthusiast since I started watching Millennium in 1996. I have been collecting memorabilia since May, 1999. Even though it sounds like a cop-out, I could never choose a single episode that is my favorite. I would say this: After watching the stories over an extended period of time, I could at least choose the third season as my favorite. As Frank Black gains greater clarity, the compassion of his character becomes overwhelming. One of my favorite scenes comes near the end of "Through a Glass Darkly." When Frank asks Max for forgiveness, there is a powerful truth in the air. Also, in "Bardo Thodol," the scene where Frank remains with the dying scientist is extraordinarily beautiful. In any film, it would be important to me that Frank's relationship and collaboration with an older Jordan should be explored. Beyond that, I trust the writers to do their best to remain faithful to the Frank Black we really know. In a world filled with chaos, it is crucial to create alternative myths that bring hope. Frank Black isn't just a character...he is an archetype of transformation. I just finished watching PRISON BREAK...a compelling meditation on courage, creativity, and the human struggle for freedom.